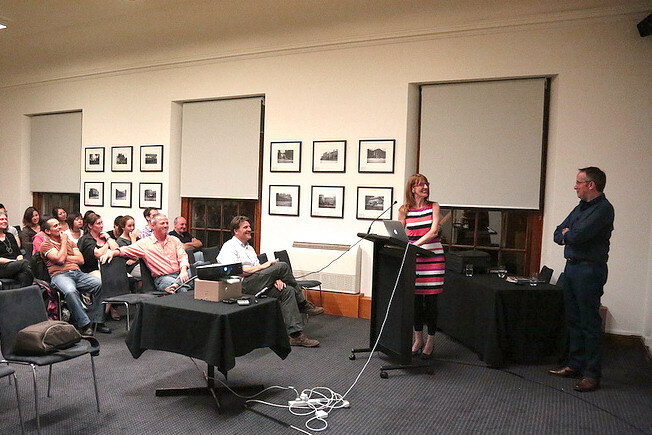 On Tuesday 3 April the AAA and Sydney University were proud to host a talk by international architect Julian Lipscombe, of Bennetts Associates Architects. In it's twenty-five years of operation, Bennetts Associates Architects have accumulated over 125 architectural and building awards. Julian Lipscombe has worked in the UK based practice for the past twenty years and is one of its directors. As founding members of the UK Green Building Council, the firm has a solid reputation as one of the countries leading environmentally sustainable designers. They have a wide portfolio of work that spans, commercial, cultural, institutional, industrial and residential. Julian Lipscombe began his talk with a brief introduction into the ethos of Bennetts Associates. Using their London studio as an example, he outlined the practice's dedication to approaching site and location with sensitivity, respect for history in adaptive reuse and intent to design sustainable buildings with a unique identity. The examples of designers, theorists and architects that Julian outlined as primary inspirations for the firms work included, Arne Jacobsen, Louis Kahn, Auguste Perret, Robert Maillart, Jorn Utzon, Carlo Scarpa, Giuseppe Terragni, Gorden Cullen and Jan Gehl. While showing a cross section of Bennetts Associates work, one could not help but draw comparisons with the theories of Danish architect, urban design consultant, design educator and writer Jan Gehl. The mantra ‘cities - life, space and buildings, in that order' is clearly evident in both the urban planning and individual built works executed by the firm. 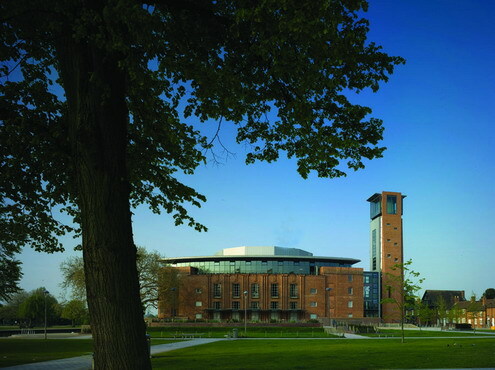 The talk culminated in Julian's presentation of their recently completed project in Stratford-upon-Avon, the Royal Shakespeare Theatre (RST). Completed in 2010, the building has already received over 500,000 visitors. The original Shakespeare Memorial Theatre completed in 1897 was extensively damaged by fire in the 1920's, leaving only the library and shell of the original theatre intact. A young English architect, Elizabeth Scott, won a competition for the construction of the new Shakespeare Memorial Theatre and this was completed in 1932. It was Art Deco in style and it's functional modern lines inspired it's comparison to industrial buildings, resulting in the building being dubbed the ‘jam factory'. In 1989 the Swan Theatre, a 450-seat space with a thrust stage, was built inside the shell of the original 1879 theatre. Bennetts Associates Architects won the national design competition for the redevelopment of building. This complex project involved the adaptive reuse of the existing heritage buildings and insertion of new built elements and public spaces. The successful elements of Elizabeth Scott's' design have been retained. 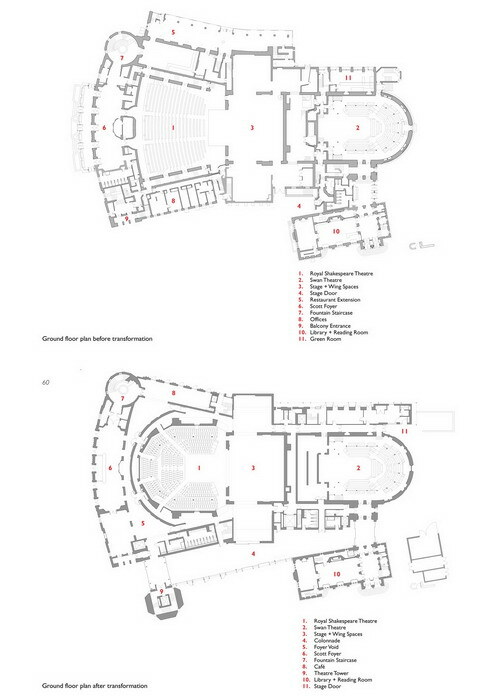 A new main entrance hall creates a link between the Royal Shakespeare Theatre and Swan Theatre, which originally had separate entrances from different sides of the building complex. The original ‘cramped' foyers have been converted into bars and cafes and much of the lovely art deco interior detailing has been retained. 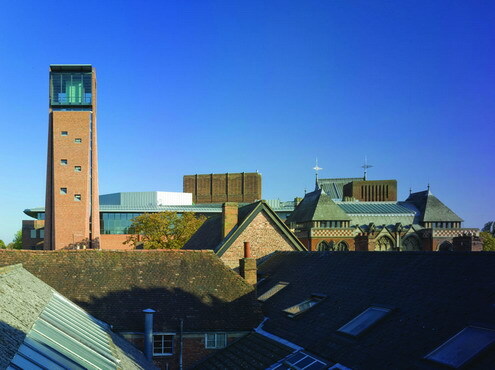 The Royal Shakespeare Theatre was completely reconfigured from its ‘cinema style' proscenium stage into a compact drum formation with a thrust stage. 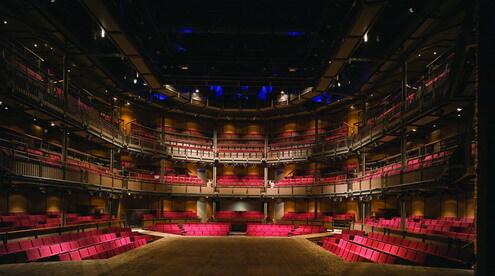 A larger scale space to the Swan Theatre, its form is one that Shakespeare would have recognised in the Globe Theatre. 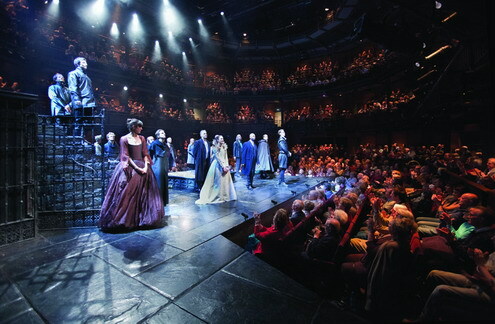 Actors are surrounded on three sides by the audience who have been seated in steep angled formation to reduce sight lines and create a greater sense of intimacy with the action on stage. Timber from the original stage has been recycled as flooring in the new entrance colonnade so that visitors can walk the same boards as theatrical greats such as Sir Laurence Olivier. Throughout the building there is a clear sense of the nature of the materials used in the building and a balanced interplay between the historical features and new features. Despite the ‘grand' nature of the building, Bennetts Associates have approached the development in a modest and understated ‘user friendly' manner, allowing the building to remain a blank canvass upon which the actors and audience can assert atmosphere. Bennetts Associates Architects are not a firm with the international exposure of ‘block buster' architects. Rather they are quiet achievers who have garnered great respect within their own country and Europe. Theirs is not a flashy or gimmicky architecture. It is one based on respect for the users of the urban environment, sensitive use of material and functionality. If you had the misfortune of not being able to attend the presentation, the talk will be available as an online CPD course at eClassroom, stay tuned!